Whether you are cooking in your home’s kitchen or you are responsible for overseeing a commercial kitchen, some everyday items are extremely flammable. 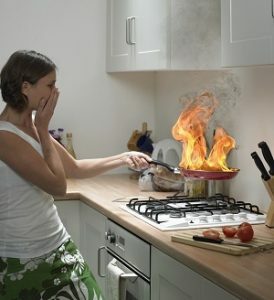 Whether you are cooking in your home’s kitchen or you are responsible for overseeing a commercial kitchen, some everyday items are extremely flammable. When it comes to ensuring proper fire protection for your home or business, you need to pay attention and make sure that none of these items ignite. It’s fair to say that while cooking is an art, baking is a science. Whether you are cooking or baking as part of preparing your next meal, you will need to keep an eye on where the flour is. Flour can burn extremely easily, especially if you use it to line a pan that has nothing else in it. Maybe you’re not preparing a banquet for family and friends this holiday season. Let’s say your talents lie in the realm of creating desserts. While you can use sugar in many different dishes, most of the time it is a key ingredient in desserts and sweet treats that help make the holidays more enjoyable. But sugar can burn too, so whether you are making a creme brulee or just toasting marshmallows in the fireplace, you need to be extra careful when you are dealing with sugar. The next time you walk into the kitchen, look and see if there is any spilled oil or any oily residue on your pots, pans, and cooking tools. Be sure that all bottles and jars of oil are kept sealed and secure too, especially if you are going to put them by a hot stove. That’s because oil is highly flammable, and oil fires can be some of the most dangerous fires you’ll encounter in a kitchen, mainly because trying to extinguish these fires with water will only make it worse. Peanut oil, olive oil, and canola oil all have different smoke points, the temperature at which they produce smoke. These aren’t the only oils you can cook with, but they are some of the most commonly used cooking oils. Don’t forget to keep your cooking tools clean as well. Whether your oven mitts are covered in grease, or your wooden spoon or plastic spatula has started to melt due to heat exposure, make sure they are all clean and in good condition before they start a kitchen fire. This entry was posted on Friday, December 7th, 2018 at 9:31 am. Both comments and pings are currently closed.